Whenever possible we have used our Christmas Day to see how many bird species we can get in our local area and this year was no different. It is a great way to spend the day together, especially if work commitments have prevented birding trips together for a few weeks. 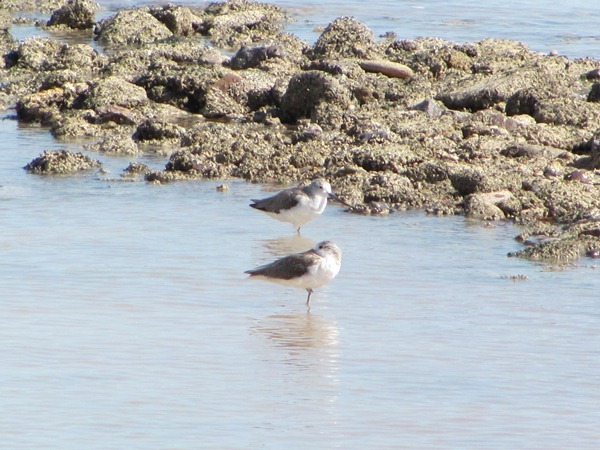 We usually try and plan a route prior to the day with particular bird species in mind and also taking into account the tidal range for the day. Unfortunately Christmas Day this year had a “low” high tide, so we knew there would be a few species we would miss out on. Doing a list for one day is always an interesting exercise as there are no guarantees and you can struggle to find a commonly seen bird and then other birds you rarely see will just be waiting for you. We had an idea that it was possible to get 100 bird species in the day allowing for birds eluding us! Target set! 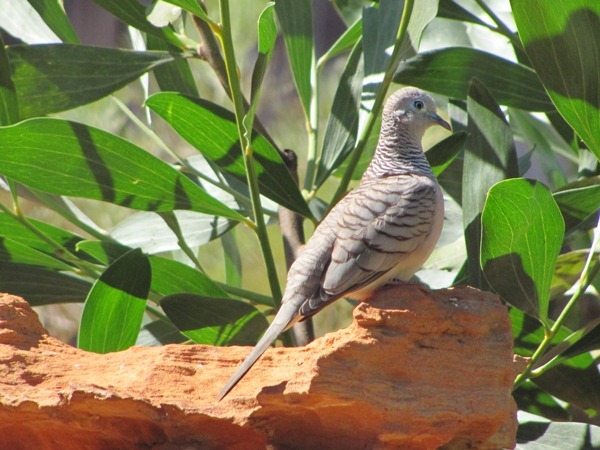 Our day started with the first peek out of the bedroom window at about 05:30am with the early morning light and we immediately put Double-barred Finch, Bar-shouldered Dove and Peaceful Dove onto the list. There was a brief interlude whilst we spoke to my parents in England before they went to bed, but then we got serious! We were surprised to hear Plumed Whistling Ducks fly over our home as we spoke to them, so we were on to a good day! We decided to have two coffees at home in the garden, so we added 16 birds to the list and set off. Our first big surprise was just down the road a pair of Wedge-tailed Eagles on a fenceline with an Australian Magpie! We rarely see them so close to town. We collected several more species before we got to Cable Beach and then we had the usual suspects-a pair of Pied Oystercatchers, Sanderling, Red-capped Plovers, Common Sandpiper, Greater Sand Plovers and Red-necked Stint. Another short drive to Gantheaume Point and the first Christmas miracle! We visit Gantheaume Point very regularly and only on one occasion had we seen the Beach Stone-curlew, but there it was waiting for us! 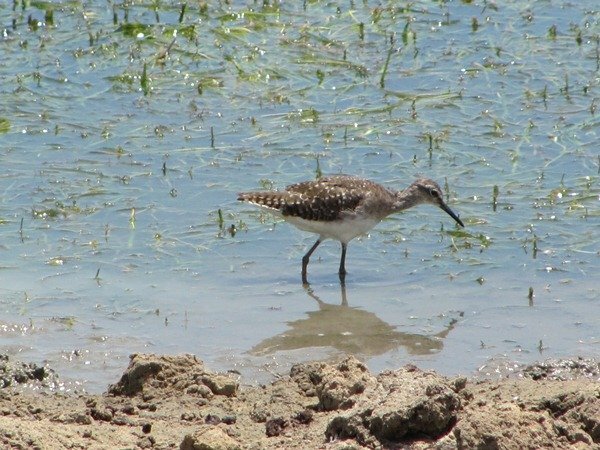 We were able to add several more shorebirds, namely the Ruddy Turnstone, Whimbrel, Bar-tailed Godwit and Grey-tailed Tattler and even a Brown Booby. The regular Striated Heron was nowhere to be seen! The unsealed road to the Port got our first of many Dollarbirds and we then searched for the Roseate Tern, as it had not made it onto my year list yet. We achieved that and had a short bushwalk to get the Zebra Finch and were lucky enough to also come across Grey-headed Honeyeaters, which was one more for the year list. We found a lone Terek Sandpiper near the slipway and then headed for the Poo Ponds. We were able to top up the list nicely there with several duck species and Royal Spoonbills, Australian Pelicans, Yellow Wagtail and a pair of Black-tailed Native-hens. The Swinhoe’s Snipe we had seen earlier in the week eluded us! 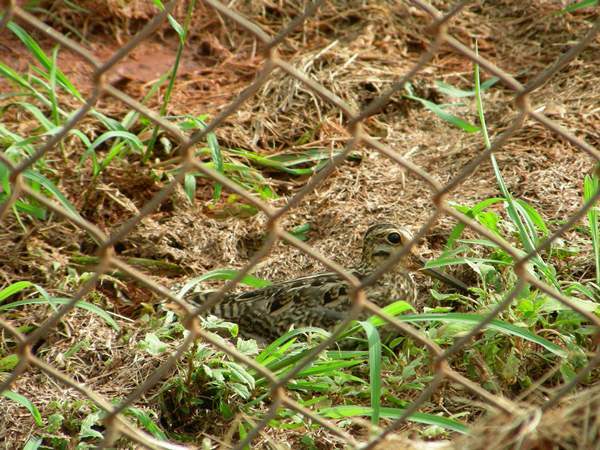 Swinhoe’s Snipe we hoped to see at the Poo Ponds, but dipped on! We walked onto the nearby beach hoping for the Pacific Golden Plover and Common Greenshank despite the low tide and also added a lonely Great Knot to the list. As we drove out of the carpark a male Rufous Whistler was sitting prominently in a tree! A brief trip to the sports field for the Oriental Plovers and then a pair of Nankeen Kestrels as we drove through town to walk along Streeter’s Jetty. We found our Yellow White-eyes, but no luck with the Red-headed Honeyeaters this time! We had made it to midday and we had 87 bird species on our list and it was looking promising for reaching 100, but where was the Willie Wagtail? We see one most days! 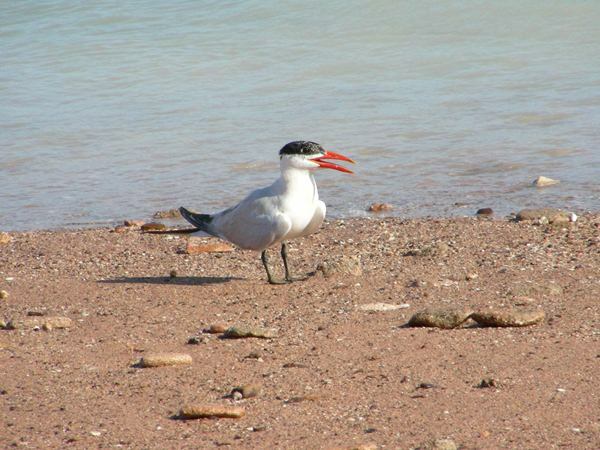 We headed off into Roebuck Bay for a picnic lunch and to find ourselves a few more birds. The Brahminy Kite was easily found and then the Grey Plover and Caspian Tern. As we ate our picnic lunch a small flock of Little Curlew few overhead calling to make sure they made it onto our list! Then to top it off we had our first Oriental Cuckoo for the year fly straight over us! Christmas miracle! The Oriental Pratincoles were also resting from the heat of the day on the mudflats. We took the road back towards the highway and finally bird number 100 at 2pm….you guessed it…Willie Wagtail! Due to the fact it was 38c/100f outside and so much nicer in the air-conditioned car we decided a drive a bit further afield would not hurt. We had achieved our 100 bird species within a 15km/10 mile radius of home. We visited an ephemeral lake and added a lone Glossy Ibis, several Wood Sandpipers, Marsh Sandpipers and Sharp-tailed Sandpipers along with Long-toed Stint. A Spotted Harrier made an appearance and the Brown Falcons that had eluded us all day were suddenly everywhere! Such are the vagaries of birding! Sadly our only Australian Bustard for the day had been taken for food and remained off our list. We were not too happy to see a feral cat in the middle of the day eyeing off the shorebirds on the edge of the lagoon. So, our last and final bird species for Christmas Day was a bird that is often seen at home, but not Christmas Day! The Blue-winged Kookaburra eluded us until the last and then we saw five on the outskirts of town! We had a great day and the final count was 124! Some avoided the list altogether that day…we’ll get them next time! Of course we hope to go through this whole exercise all over again next Tuesday, because it is the start of a New Year and therefore the start of a whole new list! What lovely birds! I’m filled with envy. 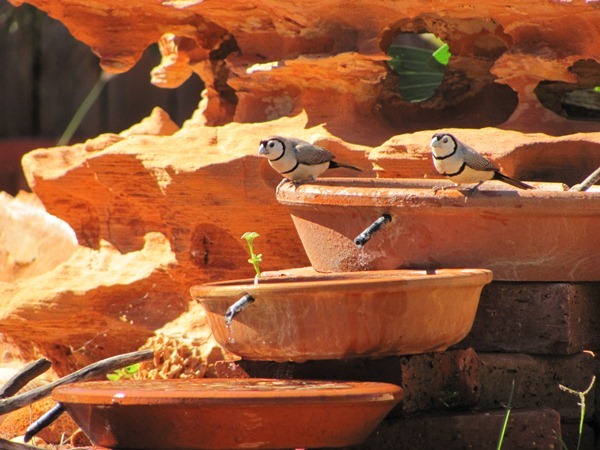 I particularly like the double-barred finches. Is that a little fountain, there, you’ve set up for them? And if so, does it attract a lot of birds? I’ve thought about putting out one of those wee solar-powered jobs out on my balcony, but so far, I’ve held off in case it ended up being entirely ignored (or worse, vandalised by gulls). That sounds like a wonderful way to spend Christmas day. I used to sometimes go birding for Christmas but in recent years family obligations have put an end to that. Finding 124 species in one day sounds magical- congratulations! 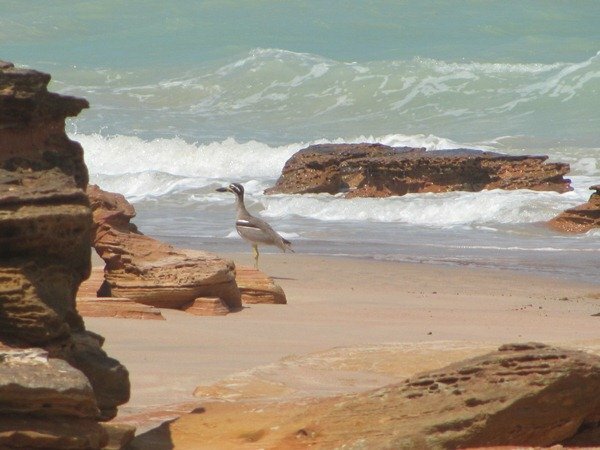 The Beach Stone-curlew must have been thrilling to see, and the photo is great, too.